When you’re out picking up groceries for the week, ever wonder what recipes the other shoppers have up their sleeves? If you shop at Trader Joe’s you’re probably too busy elbowing people out of the way and fighting over the last jar of coconut oil to really get a good look at your neighbors’ shopping lists. (Wait, does anyone handwrite those things anymore?) But if you live near the sleepy old-school Essex Street Market, you’ve surely got a little more time to poke around and wonder about the diverse cast of vendors and shoppers rubbing shoulders amid the fruit and vegetable sellers, Japanese specialty items and fancy cheeses. If there’s anywhere you’d shop to whip up something unique, it’s here. Now you can listen in on snippets of their kitchen memories with a new exhibition called Feed Me a Story. 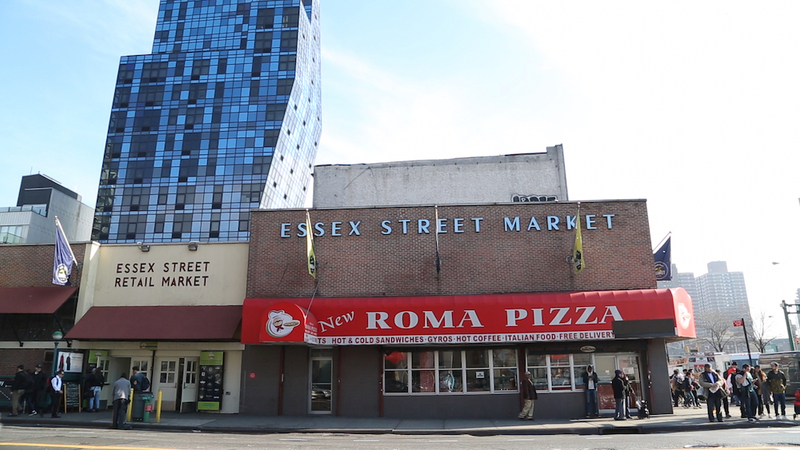 Supported by Essex Market’s in-house Cuchifritos Gallery and Project Space, the show is taking over a stall at the market, (the erstwhile outpost of Roni Sue’s Chocolates) to showcase a video compilation of the personal stories surrounding the dishes. 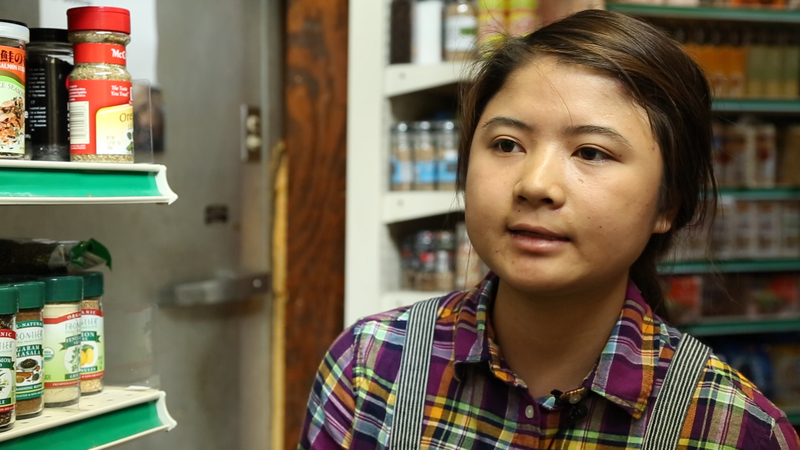 The artists behind the project, Laura Nova and Theresa Loong, actually met in the market a few years ago, at the counter of the famously persnickety Shopsin’s Diner. They got to talking and, what with Nova’s background in public art, installation work and social engagement, Loong’s work in documentaries, and, of course, their mutual interest in food, they decided to launch an ongoing project documenting recipes and the stories behind them. Soon they tested out their idea with a residency on Governor’s Island. Armed with a gussied-up airline steward’s cart, they hawked refreshments in exchange for recipes and personal stories. A lot of their future iterations of the concept have focused on the immigrant-rich Lower East Side, and they’ve done a similar project with seniors in the area and a recipe billboard at 2nd Ave and Houston for Lower East Side History Month. For the Essex Market version, they filmed interviews in the market during the week of Thanksgiving, asking people to tell them about a recipe they were preparing, hoping to evoke stories about family and tradition. “If you watch any of the videos, it’s really more than the recipe,” said Nova. “The recipe is just a kind of a backdrop to the stories of family and relationships and cultural heritage and immigration and traditions, and also new traditions and new ways of doing things. It shows how food is really a backdrop to that sort of social engagement.” Thanksgiving was a perfect time to solicit stories because the dishes and traditions reflected how Americans from different backgrounds make the holiday their own– from Puerto Rican sancocho, to homemade Ukranian bread and Burmese fish. 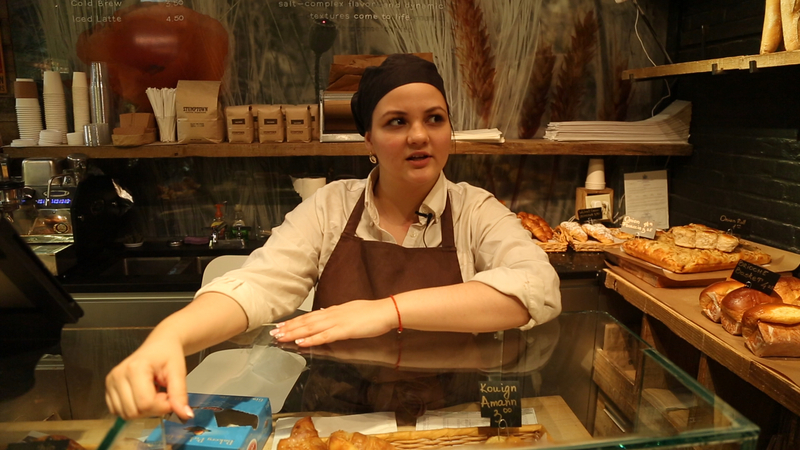 The short videos (more than 20 of them) aren’t highly produced, so they feel like casual conversations with vendors and shoppers in the market if you were to actually go up to them and ask what’s in their basket. In one video, Sobeida, of Viva Frutas market, tells of her mom’s magical potato salad in the midst of bagging and ringing up groceries for customers, a non-stop job. In another, Seiko, a Japanese culinary student, shows off a Kabocha squash from one of the vendors and explains how to prepare it for Asian-inspired Thanksgiving pumpkin dumplings. The show, which runs through June, is having its opening reception on Saturday, during the Essex Market’s 76th anniversary blow-out block party. Just another opportunity to celebrate the market in its current form, before it moves to a new facility across the street in a few years as part of the new Market Line of Essex Crossing. Feed Me a Story at Essex Street Market, 120 Essex on the Lower East Side. Open Tuesday through Sunday, 12 pm to 6 pm. Opening Reception Saturday May 21, 1 pm to 3 pm.